Robert Corfield, a hairdresser from Aberystwyth, had joined the Cardiganshire Battery of the 1/2nd Welsh Brigade, the Royal Field Artillery within a week of the start of the war in August 1914 and subsequently volunteered for service overseas a month later. His battery, as part of the Brigade, was posted to Bedford to undergo training before deployment to the Western Front. It was while practising artillery drills in a field off Ampthill Road, Bedford on 26 August 1915 that Gunner Corfield fell from the gun on which he was mounted. As he fell backward off the gun limber the wheel of the horse-drawn gun carriage ran over his head. Gunner Corfield lay unconscious as Captain John Cook of the 2/1st Welsh Field Ambulance, the Royal Army Medical Corps tried in vain to save his life but his skull had been crushed and he died shortly afterwards. 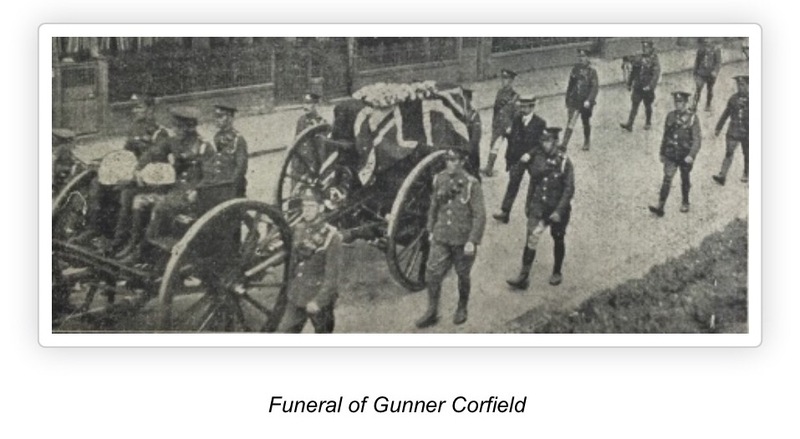 The coroner at the inquest into his death made clear that Gunner Corfield was prepared to fight for his King and country and had died as nobly as if he had been killed on the battlefield. There is a full report of the inquest and Gunner Corfield’s funeral in The Cambrian News and Welsh Farmers’ Gazette of 3 September 1915. He was buried with full military honours in Aberystwyth. It was only after an 18-month long campaign by the West Wales War Memorial Project that his death was formally recognised in 2014. 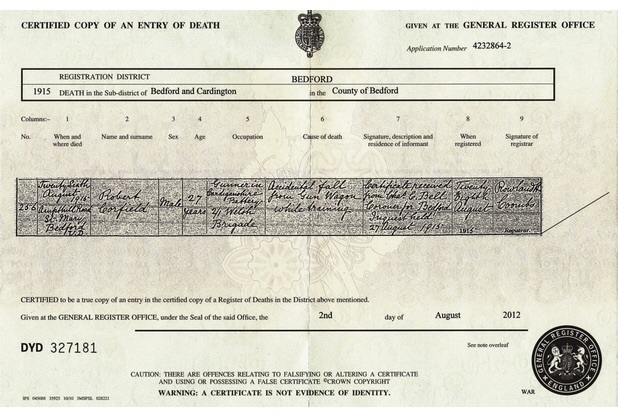 His name has since been entered in the United Kingdom Book of Remembrance and recorded in the Commonwealth War Graves Commission data base.